Complete the Checkout process quickly! Rock GT-50 Sparkle! – One of the worlds most popular skates just got a NEW shot of bling! Rock GT-50 Sparkle! – One of the worlds most popular skates just got a NEW shot of bling! Great entry level complete skate package for Recreation, Jam, Speed! and beginning Derby! The Rock GT-50 Sparkle made by Sure-Grip is a great starter package featuring a super comfortable synthetic boot which fits a bit wider to accommodate almost every foot! The ROCK Nylon plate is a Special Edition Clear version and is a superior plate chasis than most others in this category category! Comes standard with GT-50 black/white swirl indoor rink wheels 95A, ABEC -5 bearings, and Carrera 5/8" speed toe stop. 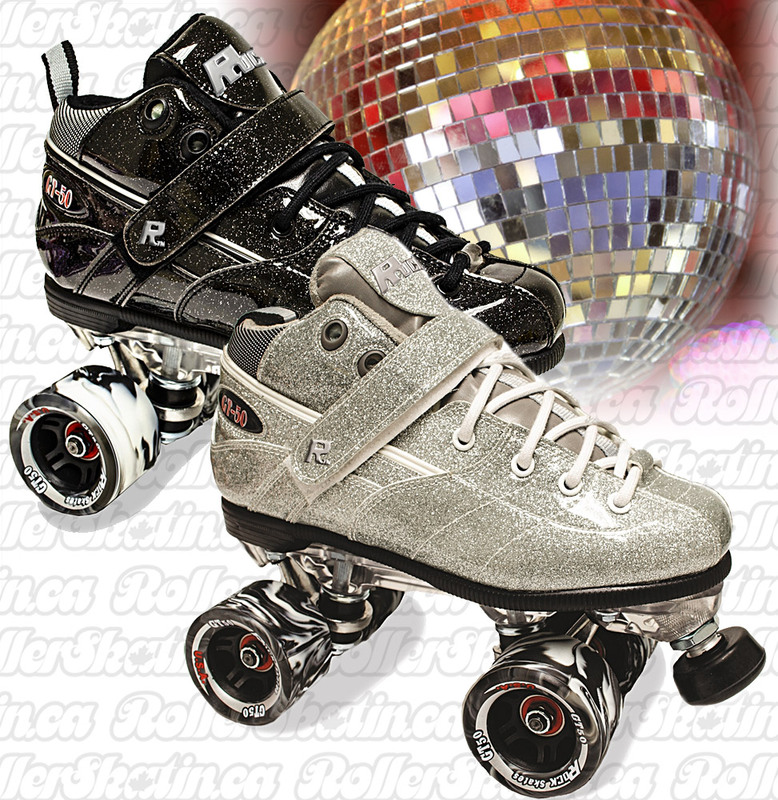 Get your Bling on in a great reliable skate – Comes in two great shiny patent finishes: Black Sparkle and Silver Sparkle! Available in Men's sizes 4-9. Ladies sizes go down one size (ie. Mens 7 = Ladies 8). • • Order a set of Outdoor wheels at the same time (with FREE bearing installation!) for Outdoor Skating! • • OR substitute the standard indoor wheels for Outdoor wheels! • Ask about Other UPGRADE & SUBSTITUTION Options; Plates, Wheels and Bearings. Sure-Grip Rock GT-50 PLUS Light-Up Skate! Back instock! BOOMERANG Performance Outdoor Speed Wheels 83A Set of 8! SUPER SAVINGS - LIMITED TIME OFFERS!! 1 ONLY - LAST CHANCE! Please login to create your wish list. How Do I Select The Right Size?